We are back from Paris and have recovered from all the walking carrying our heavy camera equipment. Our hotel was one street back and mid way between the Louvre and Place de la Concorde. Very central and handy to walk to most places and for the metro. The weather was very warm and we didn’t even need a sweater even at midnight. Perfect. Apparently it became very hot after we left so pleased we missed that. I am now working through the processing of some 1300 images. However I do have some textiles to show. These are for the Venice project. 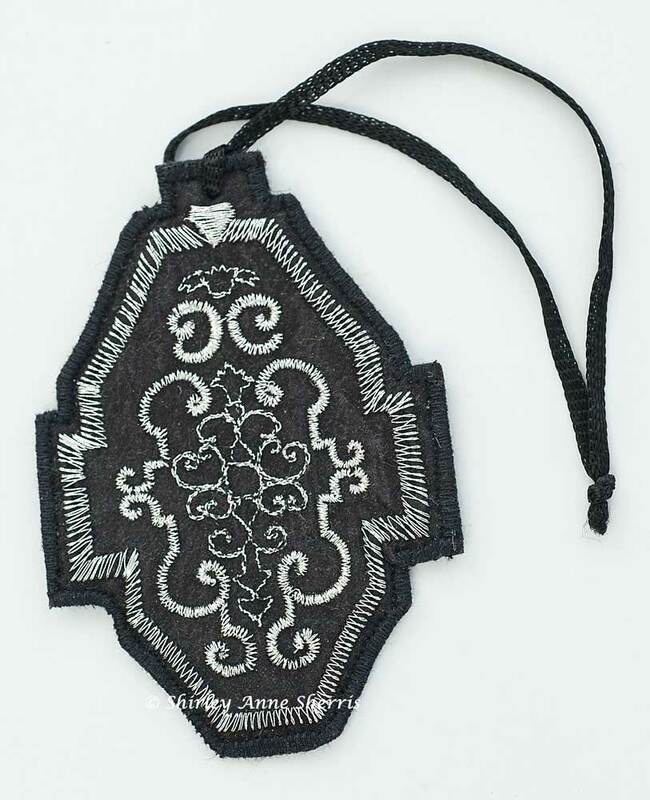 I have already shown two of the iPod pouches which were inspired by the patterns of the carved windows of the Basillica. Here is one more which I finished stitching in Paris. 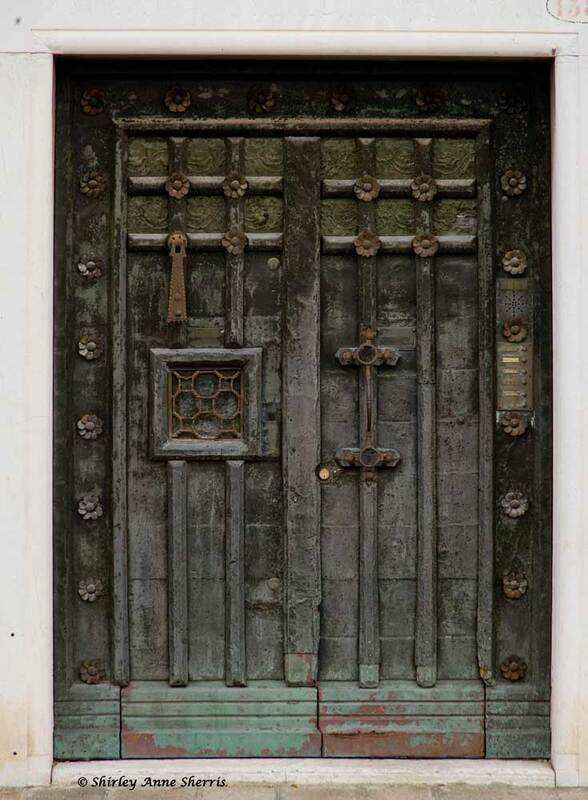 There were many impressive doors in Venice most of which were very neglected but wonderful for me as they had so much texture and character. This door must have been so grand originally and taken such a time to construct. It has, however, led to a number of designs, this being one of them. It was a bit of a rescue (yet again) as I was trying to use up some old paint. It had gone off and was full of gritty bits. I added patina fluid to create the verdigris as on the door. Then I washed it with some diluted black ink. I had thought of putting some sheer fabric over it but decided I quite liked the gritty texture and the colour had turned out well. 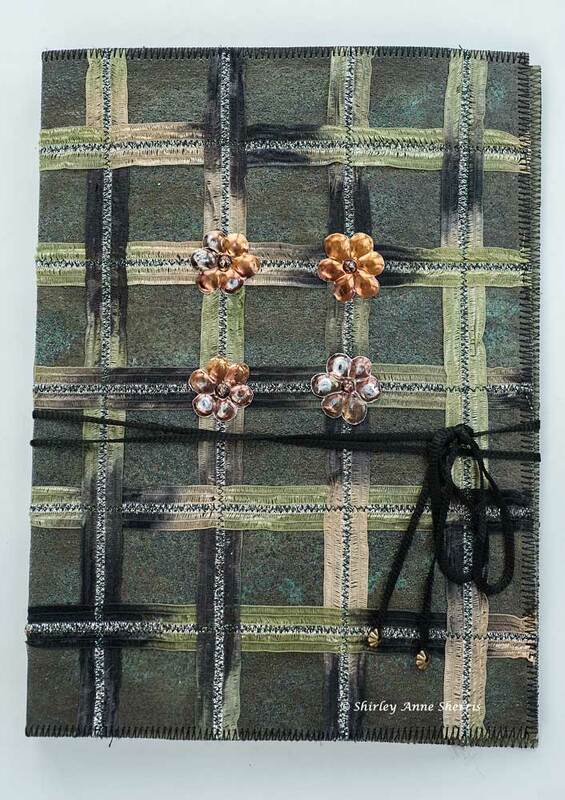 I used some variegated dyed sari ribbon to make the woven squares. 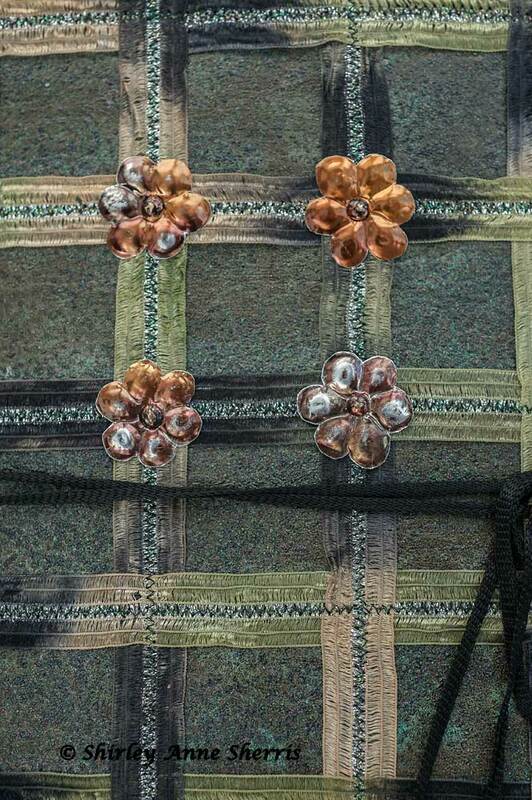 The centre of this ribbon was silver metallic and as the other embellishment was to be copper I decided to over stitch it with a dark green metallic thread to tone it down. I made four flowers with embossed burnished copper shim. These were held in place with brads which I dabbed with black paint. 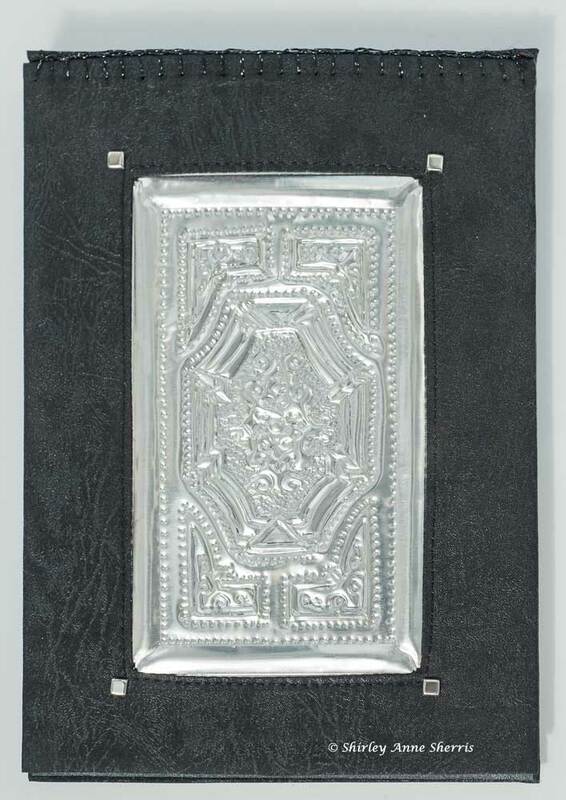 Another impressive door was decorated with embossed and studded black leather panels like this one. 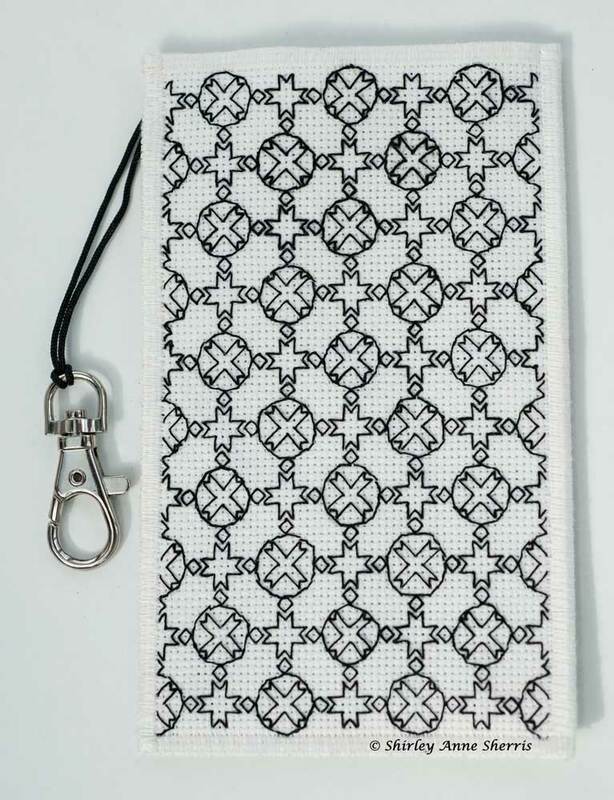 I used this design and created a pattern in numerous sizes. 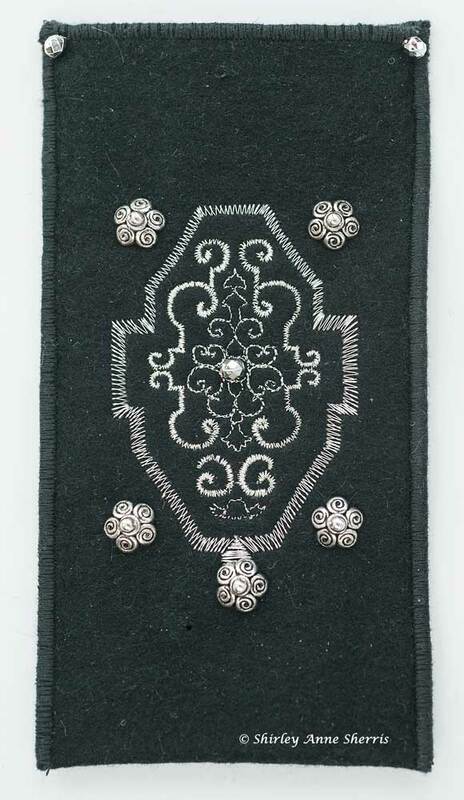 I digitised this design and stitched it using silver metallic thread onto black felt made up into a glasses case. I used it again to make a bag tag. 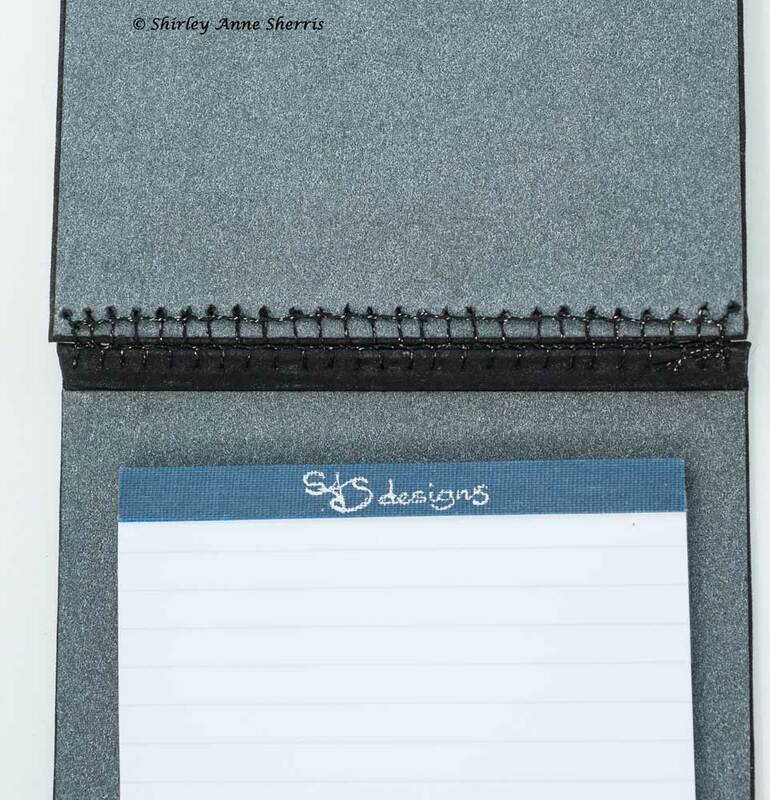 I embossed the design onto silver shim and made it the centre of this pad booklet. In keeping with the original door, I used a faux black leather fabric for the backing fabric. I had a really nice silver/black mottled card for the inside of the booklet. I hand stitched the front to the back to make a flexible hinge. We found this amazing workshop door while wandering in the back streets one day. 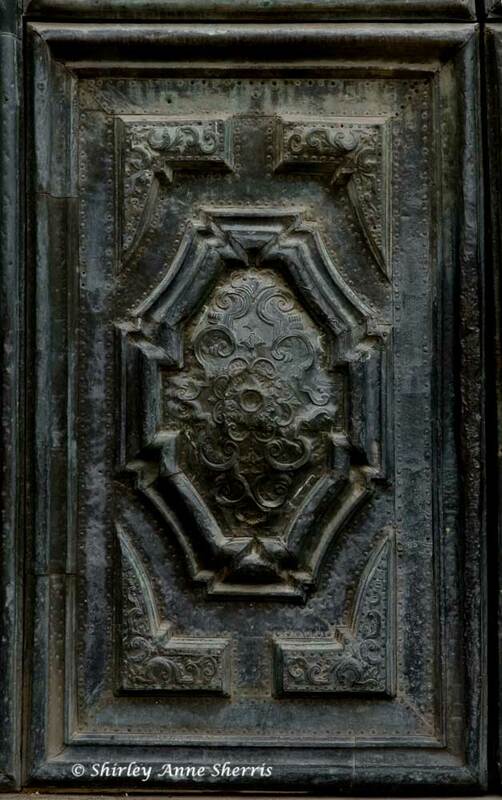 The hinges were a work of art in themselves. I decided to use this as the design source for the file cover for this project. I will keep sketches, patterns and printouts etc and some of the small pieces in it. I dyed and painted some heavy duty linen which was given to me by my father many years ago. It was unused filter bed fabric. It was ironed but not thoroughly so that it kept some of the creases for the wood effect of the door. I made the hinges from pelmet vilene which I painted with bronze metallic paint sponged with black to age it. I used brads for the studs on the hinges and on the wood effect fabric. 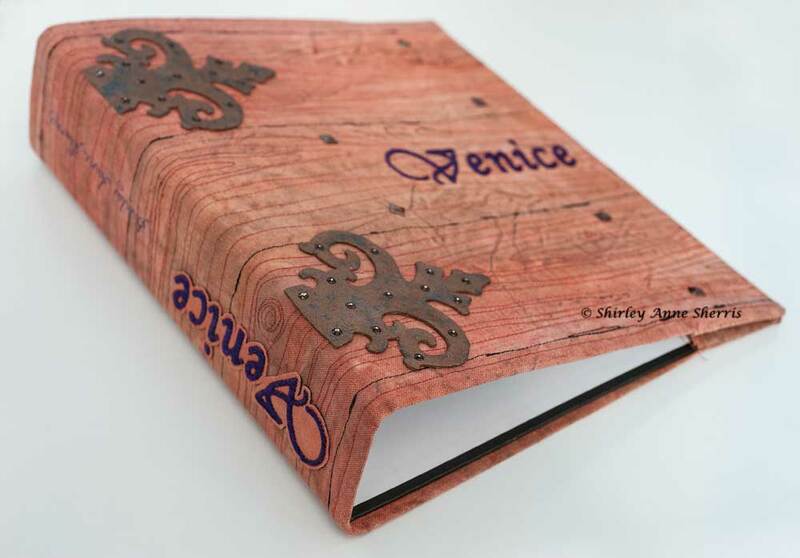 I digitised the name of the project ‘Venice’ and stitched it out on the front and again for the spine. I free machined my name down the spine too. That is it so far with more to come. What I really like is the range of techniques that you use in your work. I would be hard pressed to say which I prefer although I might be leaning towards the one done with the gritty paint. Hi Thanks for the comment. The gritty paint did turn out well in the end. Hoping for another 70+ project again which will give me another talk to give to the groups, although with all the images I took from the two visits there could well be more than that. Hope your sales of fabric are going well. 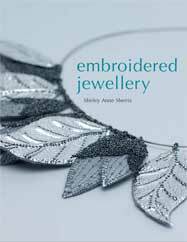 At last Embroidered Jewellery is available NOW.